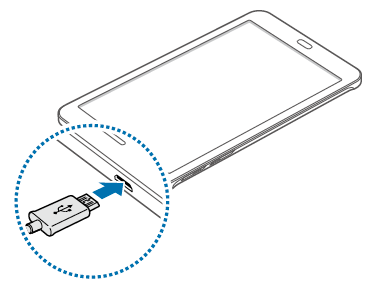 You can use the supplied USB connector to connect your device directly to your computer and transfer music, pictures, and other content files. 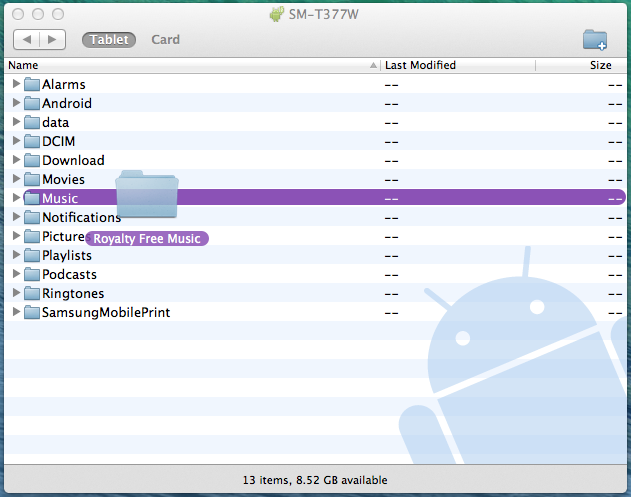 For example, if you have a music album stored on your computer that you want to listen to on your phone with any of the music apps, just attach your device to the computer and copy the files to the music folder. 1. Connect your device to your Mac computer using the supplied USB/charging cable and an available USB port on your computer. 2. Once connected, an error message might be displayed on your Mac computer. 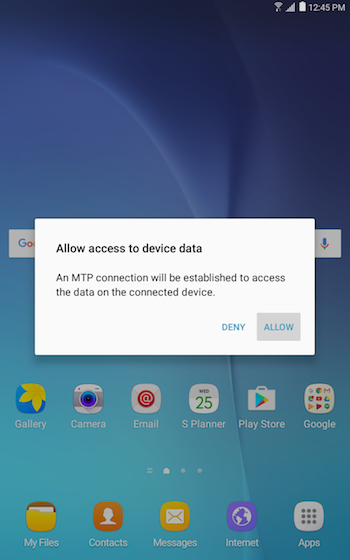 This is normal: a Samsung device is designed not to give a direct access to a computer when connected, to protect it. You have to allow the connection by touching ALLOW on your mobile device screen. 3. A pop-up window showing the files tree of your mobile device will be displayed on the screen of your Mac computer. 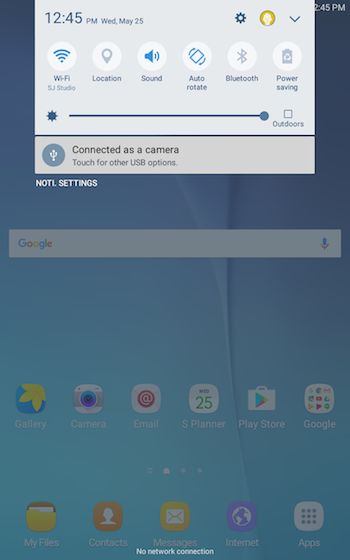 Select Tablet for internal device storage (this option is selected by default) or select Card if you have microSD card installed on your device. 4. Copy files as you would do it with your Mac computer. For this example, we transferred files to the Tablet. We selected a folder, Music, for songs and albums, to copy files into from your computer. You can also create a new folder. 5. The transferred files are now saved to your device. When you are done, disconnect your device from your computer. 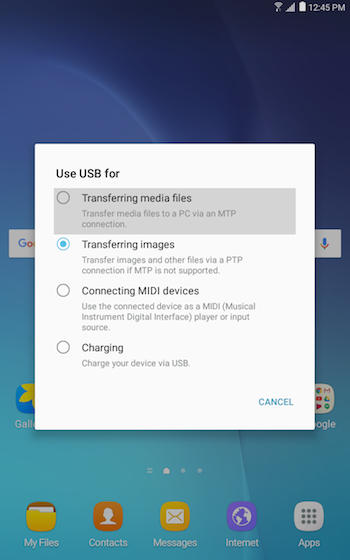 Important: You can also copy files from your device to your computer, follow the steps above, but instead of transferring files from the computer, transfer files from the device to the computer. 1. 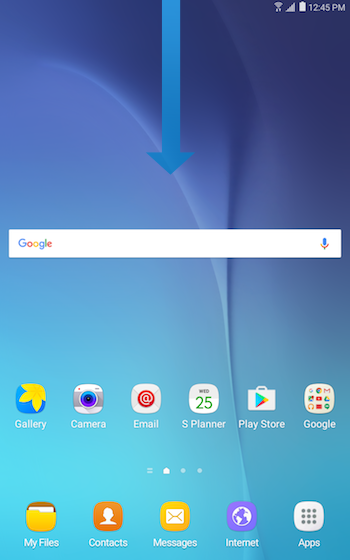 Swipe down to open the Notification panel on your mobile device. 2. A notification will be displayed. You will see Connected as a camera, USB for MIDI or Connected. Touch the notification to access all the available protocols. 3. For most transfers, you will want to use the protocol "Connected as a media device". Touch Transferring media files to start using the protocol. 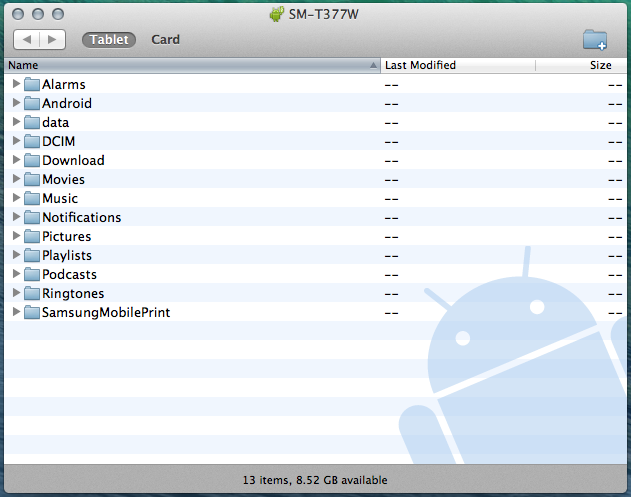 Where are my photos and videos stored on my Galaxy Tab E LTE? How can I move them? Galaxy Tab E LTE: How do I print wirelessly a document from my Samsung Galaxy Tab E LTE?